The software features a Windows and Mac-based GUI designer, which lets the user easily, combine text, images, buttons, sliders and other widgets across multiple panels and pages in custom compositions. Functions are assigned from a library of pre- configured actions with simple drag-and-drop. WATCHNET is used to control WATCHOUT shows running on Display PCs or Dataton WATCHPAX media player. It can manage an unlimited number of systems, including power, lighting and other auxiliary functions in a WATCHOUT show – great for large-scale installs such as multiple rooms in a museum or corporate headquarters. With a single iPad in reception the user can start, control and manage multiple WATCHOUT systems from a clear, custom-designed interface. For more advanced uses, WATCHNET offers direct control of WATCHOUT timelines and inputs, with full feedback, to monitor performance. 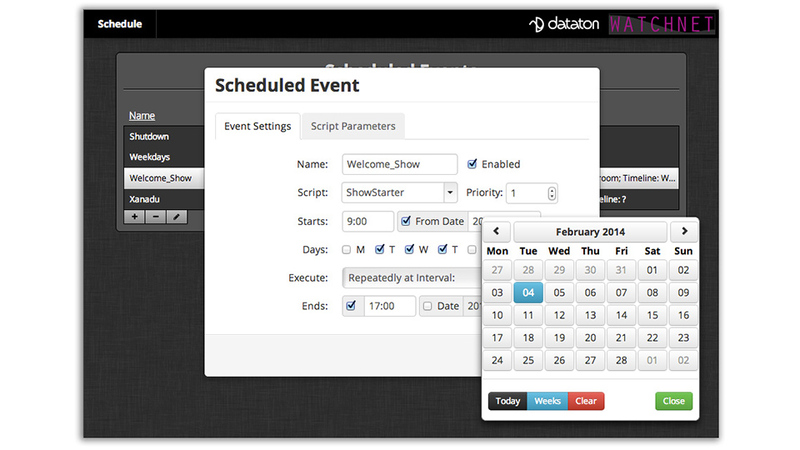 WATCHNET features a flexible scheduling function for fully automated control. Define days, times and other parameters and let WATCHNET do the rest. The software also manages show updates for adding new media and programming. WATCHNET auto- discovers and monitors WATCHOUT clusters on the network, enabling easy set-up for integrators. Online user guide available here. 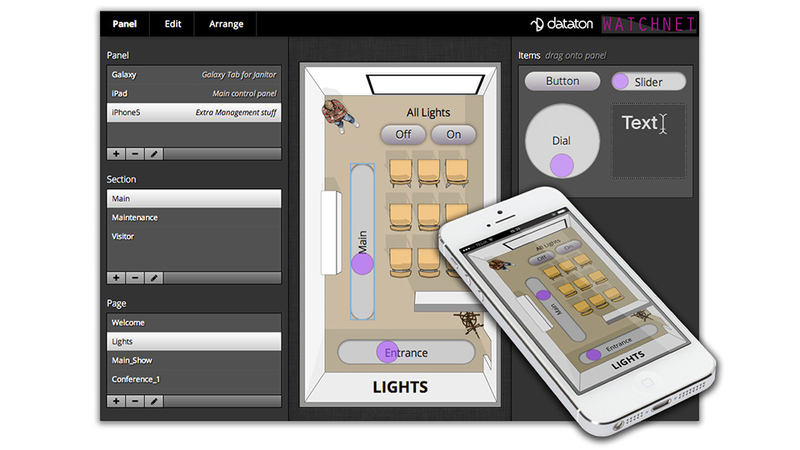 Dataton has released version 1.4 of WATCHNET, network-based software for custom control of WATCHOUT systems! WATCHNET can now connect directly to a WATCHOUT production computer and control it in the same way as a display cluster, using panel items or scripts. This opens up for new working methods – especially in live events! A selection of well-known protocols are now included with the software, making it easier and faster to set up control of external devices. You’ll find the list under “Devices” and it includes protocol commands for PJLink projectors, LG monitors, Barco/Projectiondesign F series projectors. Keep an eye on what's happening in your WATCHOUT show – WATCHNET now displays dynamic text fields showing input values and timeline position. WATCHNET is powerful multi-tasking server software for custom control, scheduling and managing of Dataton WATCHOUT multi-display shows. A bug has been fixed in the WOB file distribution to a WATCHOUT cluster where Image Sequences were not distributed. Sliders are now rendered correctly and title text-orientation adjusted in vertical mode. Titles of Panel Items are now correctly clipped if they are too large for the item. Panel Sliders can now correctly deal with any value ranges. Media uploading for Panel Items has been greatly enchanced. Cluster input names with white spaces are now correctly handled. Installers for both Windows and Mac. All panel items have had their properties dialog updated. The new dialog introduce various visual appearance settings of panel items and allow for manual setting of size and position. The image panel item now has a property dialog. Video functionality has been introduced and placeholder items may be created both for videos and images. These placeholders may be positioned and sized prior to selecting content.